The reason this Enrichment gallery has rubber and rocks in the title is because most fountains come with some rubber piece that seals the water flow. Then, rats don't like rubber, so they may effectively destroy the fountain if they reach the rubber. Ergo, rocks. Except rats like to stash rocks. A fountain is GREAT, just plan on addressing the rubber and rocks problems. The other major concern with fountains is the electrical cord. Again the rubber problem. I have the fountain sitting across two tables whose ends meet, so the cord can drop down between them. Then I have fleece wrapped around the base, with the base sitting on the fleece, covering the cord. A real anti-rubber rat might be able to pull out the fleece and reach the cord. In this video you will see the rubber and rocks issues play out. My solution, that let me win the day on the rubber problem, is the last slide in the video. 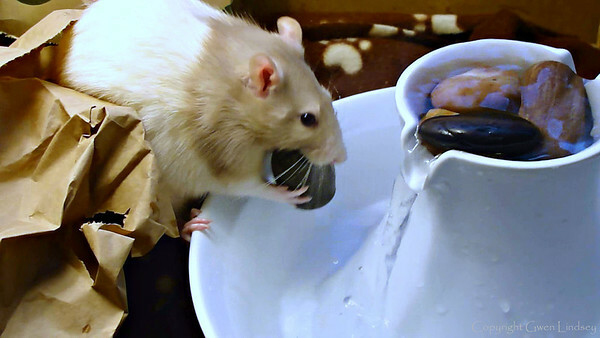 Fountain enrichment for pet rats! Don't forget the "rubber gotcha". Rock firmly between this teeth, he pulls it up and out of the water.